The Hovawart is a German working breed; the name meaning ‘an estate guard dog.’ The rbeed was developed for guarding purposes in the Black forest region but became extinct at one point and were then revived during the 1920s. 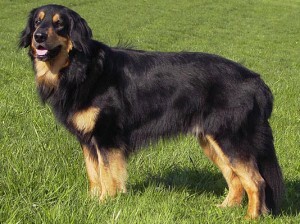 They are very famous in their native country Germany but are still rare in the United States and hence are not recognized by the American Kennel Club as of yet. The Hovawart is a healthy breed of dogs, living for nearly 10 to 14 years, suffering occasionally from hip dysplasia and under active thyroid dog disease.